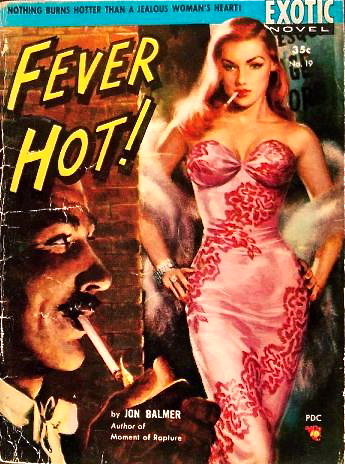 Fiebre de Venganza was originally released in the U.S. as a vintage sleaze title known as Fever Hot, written by Jon (Moment of Rapture) Balmer. The Argentine reissue has many appealing qualities. I especially like the wavy, intensely reddish quality of the girl's hair, which somehow matches her clothes perfectly and duplicates almost exactly the shading of the girl's hair from the first printing. Coincidence? Likewise, the guy smoking a cigarette is a nice touch as it recalls the cigarettes from the original. In sum, the alas anonymous cover for Fiebre de Venganza is a very pleasing, eye catching design. However . . . a glimpse at the Exotic Novel original reveals that quite a bit of sizzle has been lost in the aesthetic translation. P.S. Can anyone tell me about the mysterious goings on outside the window just beyond the ladder in the Colleccion Deborah version?